The Rite of Spring isn't the only star article → Find more of them! The Rite of Spring is a neoclassical ballet, with music and story by Igor Stravinsky, choreography by Vaslav Nijinsky, and stage designs and costumes by Nicholas Roerich. The ballet was created for the 1913 Paris season of the Ballets Russes. The Rite of Spring does not have a traditional ballet story, but is rather a series of pictures depicting pagan life and pagan rituals. These pictures lead to the final moments of the ballet when the chosen maiden dances herself to death before the elders to propitiate the gods. 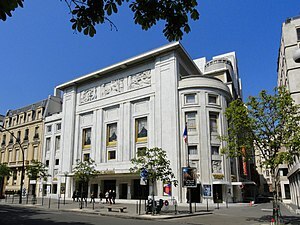 The Rite of Spring was first performed at the Théâtre des Champs-Élysées on 29 May 1913. The avant-garde nature of the music and choreography caused a near-riot at the theatre on the evening of the premier. Rite received mixed critical reviews. After a few performances in Paris and London, the ballet left the stage. Over time, the choreography was forgotten. In the 1920s, Léonide Massine choreographed the work anew. Other choreographers offered their versions, until the Joffrey Ballet restored Nijinsky's original choreography in the 1980s. In 1940, the Walt Disney Studios adapted the score for a segment in the animated feature movie, Fantasia. This segment depicted prehistory and the extinction of the dinosaurs. Although Stravinsky later said he abhorred the adaptation, he said nothing critical at the time. The composer Paul Hindemith said, "Igor appears to love it". This page was last edited on 20 June 2014, at 05:41.